Interesting to note are where urban population has decreased, particularly in post-Soviet Eastern Europe. Migration to western countries for various reasons have been a factor, as well as a post-Soviet trend for lowering birth rates (see more here and a detailed European rural-urban map here). Highly noticeable on both maps are urban and rural increases in Sub-Saharan Africa, reflecting probable increases in living conditions and improvements in child mortality (i.e. less of this). However, despite, some ‘escape to the country’ in ‘Western’ countries, generally there is a global trend outside of Africa towards rural population decrease, a continuing post-industrial trend. Besides employment and social pull factors towards the ‘city’, relative rural poverty is an often overlooked factor in this trend. While I have lived in an urban area all my life, the focus of my undergraduate dissertation investigated the impacts of bank closures and online banking in rural areas, and one of the findings was that often rural areas are at the back of queue for services, whether it be broadband, social, economic etc. The (often British) stereotype of the idyllic rural idyll is flawed, especially in particular regions or countries (see more here), with closures disproportionately hitting rural areas and a focus on funding in urban areas. Particularly noticeable on the rural change map is the rural decrease in France and Japan, where in the latter of these there is an ageing population with a dramatic fall in birth rates are contributors too. Producing and investigating these maps are interesting, but it importantly shows that generally we are still in an urbanizing age, where differing stages of socio-economic ‘development’ (what do we define as ‘development? 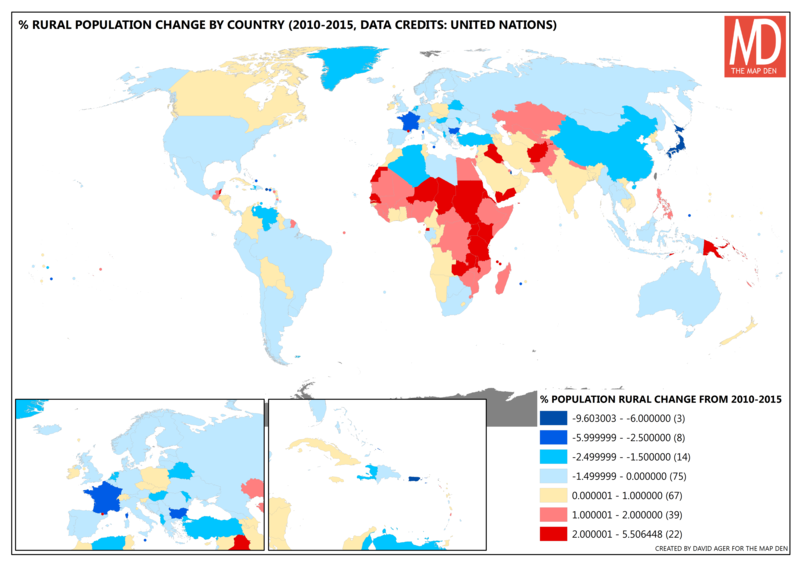 ), and population trends influence geopolitics in many ways from resource pressures to conflicts.